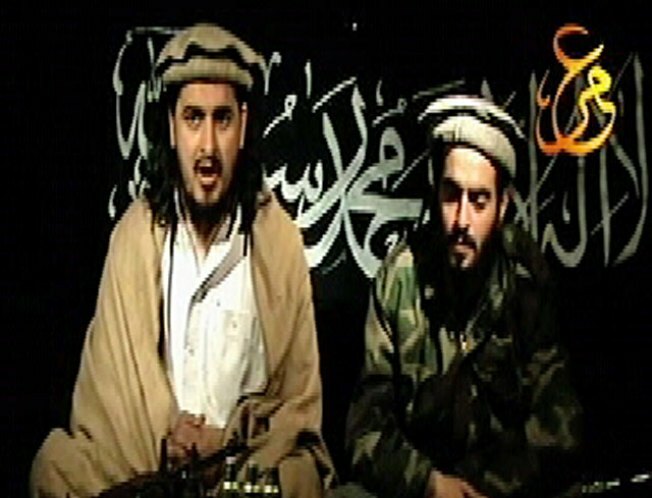 Hakimullah Mehsud, left, is the leader of Tehrik-e-Taliban Pakistan (TTP), a terrorist organization based in the tribal areas of western Pakistan, along the border with Afghanistan. WASHINGTON - The Justice Department has filed criminal charges against the leader of the Taliban in Pakistan, accusing him of involvement in the deaths of seven CIA employees in Afghanistan in December. Hakimullah Mehsud was charged Wednesday with conspiracy to murder U.S. citizens abroad and conspiracy to use a weapon of mass destruction, namely explosives, against U.S. citizens abroad. Court documents accuse the Pakistani Taliban with playing a role in or claiming responsibility for the December 2007 assassination of Benazir Bhutto, the September 2009 suicide attack on the Bannu, Pakistan, police station and numerous attacks on NATO supply lines. Also on Wednesday, the State Department designated the Pakistani Taliban as a foreign terrorist organization and designated Hakimullah Mehsud and another Taliban leader, Wali Ur Rehman, as specially designated global terrorists. The State Department's Rewards for Justice program is offering a reward of up to $5 million each for information leading to their location. The attack on the U.S. base at Khost, Afghanistan, in Dec. 30 was carried out by a suicide bomber identified as a Jordanian doctor, Humam Khalil Abu-Mulal al-Balawi. He was described as a double agent who had been considered a key asset by the CIA.